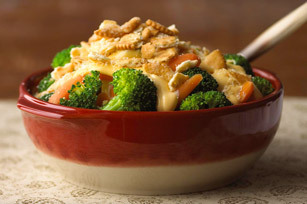 Find the perfect weeknight meal with this Easy Carrot and Broccoli au Gratin. This Easy Carrot and Broccoli au Gratin is scrumptious yet simple. Bring 3 cups water to boil in large saucepan on medium-high heat. Add carrots; simmer on medium-low heat 8 min. Add broccoli; simmer 3 min. or until vegetables are crisp-tender. Meanwhile, mix cracker crumbs, Parmesan and butter until blended. Microwave VELVEETA and cream cheese in 2-cup microwaveable measuring cup on HIGH 1 min. ; stir. Microwave 30 sec. or until VELVEETA and cream cheese are completely melted and mixture is well blended when stirred. Drain vegetables; place in serving bowl. Top with cheese sauce; sprinkle with crumb mixture. Serve this cheesy vegetable side dish at your next special-occasion meal. Look for 3/4-lb. packages of fresh broccoli florets in the produce section of your supermarket. Each bag contains about 4 cups which is just the amount you need to prepare this tasty recipe.